For reports on work, student work and create a variety of documents requires the creation of content. Very inconvenient to constantly update the titles of the chapters, which vary in the course of work, and especially the page numbers. For easy use automatic table of contents in Word. Enter the required Chapter titles and sub-headings, highlight them and in the tab "Paragraph", set their level. They can be different, in this case, the styles of their design may differ. 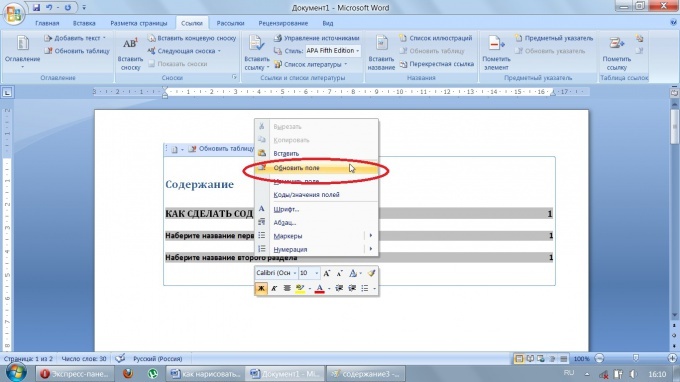 On the page where you want to place the auto contents in word, position the cursor. Click on the Link tab at the top of page icon table of contents, select any style. So appears automatic content. In this section, if necessary, created the TOC, you can remove in one click. Using the tabs "Paragraph" and "Font" the text is auto contents in word you can format. You can change indents, line spacing, spacing, size and type of font, its color and style, and other characteristics. To automatically change the table of contents, you must click on it right mouse button, select the tab "Update field", one of the update modes, enables you to change either the entire text or only the page numbers. To select at one time a few snippets of text, such as changes in the level subheadings, you must use the mouse, holding the Ctrl button. This will save time when you create automatic content in word. If you ever typed a text for coursework or self-book in MS Word, then you know how uncomfortable to constantly change the content, if the amount of material constantly arriving. The headings and numbering of pages just to move out. A very unpleasant fact, especially if you do the work necessary in a short time. To concentrate on the writing work, not tracking content, you must enable automatic content in a text editor. 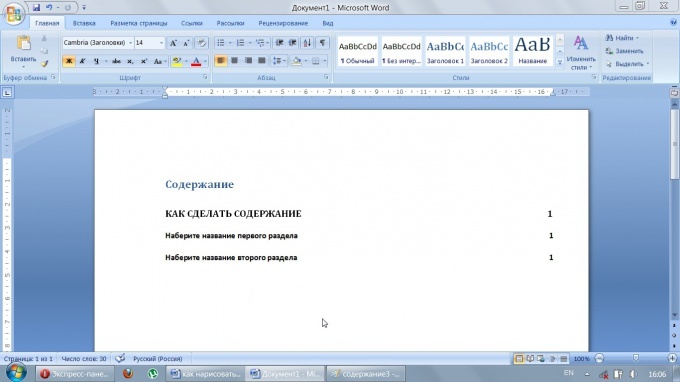 Software Microsoft Office Word 2007. Automatic content in MS Word 2007 allows you to configure it once, and then the items in this list will automatically change. Let's examine the action of the function on a simple example. 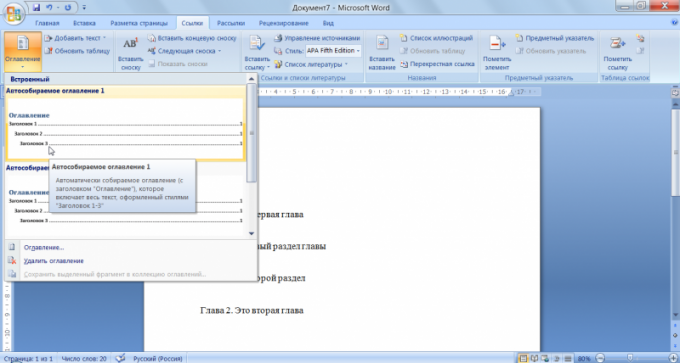 Open the editor and create a new document, by default, it is created when the program starts, if it does not, then press Ctrl + n and start typing a few lines on different pages, you can type the text arbitrarily. Don't forget to share the points of your small headings: section and subsection. Select the titles of your sections (No. 1, No. 2, etc.) and ask them the style, for example, "Heading 1". Ask the style on the Home tab, selecting "Styles". Select the names of your subtopics (No. 1.1, 1.2, etc.) and ask them the style "Heading 2". The names of the styles listed here are taken as an example, you can use any of the styles that will be combined with each other. Now that all sections and subsections you set the style, you must enable the option "Automatic content". Depending on the translation of Microsoft Office, the name of this function may be different. Go to the tab "Links", then click "table of contents". Select any type of "Automatic table of contents (content)". The result of the above actions, you will have the table of contents that will automatically be set as the content of the document information. To force a change of contents automatically replace, right-click on the content item and select "Update". The availability of content in any document will greatly facilitate the work with the text. Especially if the file is very large. 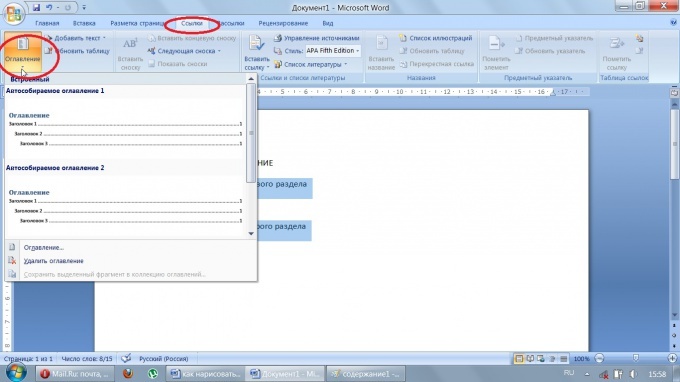 Try to create a text with the function of automatically collect table of contents using Microsoft Word. To begin the registration document with table of contents, create a new file and type in the text that require further editing. Or open ready. Label the sections, enter the headings and subheadings. Highlight the title and use the formatting toolbar, next to the icon "A" (or in the right sidebar), select these fragments matching the "Styles". In this case, you need to choose Heading 1. Go to the "Styles and formatting" from the format item in the upper work panel. Then highlight the text of the first subtitle and set it the parameter "Heading 2". Follow these same steps for the following sections. After all, the text is divided into headings and sub-headings, in the top panel in the menu "Insert" select "Link" and go to "indexes and tables". Then look in the opened window, select "Formats" and select the most suitable for your document version of the design. Click "OK". Thus, you will choose one of the ways automatic table of contents. In this window you can also note main page setup, numbering and location of each relevant page numbers. By doing this, you will create a table of contents, which if necessary can be updated. If amendments to the text of some sections moved to other pages, don't worry. To return to your seats is quite simple. It is enough to click right click in your TOC and from the drop down window click "Update". To change the table of contents, and in that case, if you hover on it the text cursor so that the content stood out the text and then press F9. For these purposes a special designed panel with a button "Update table of contents", which opens in sequential menu selection "Insert" sections "Reference," "index and tables" and selecting "outline Pane" in the window format. 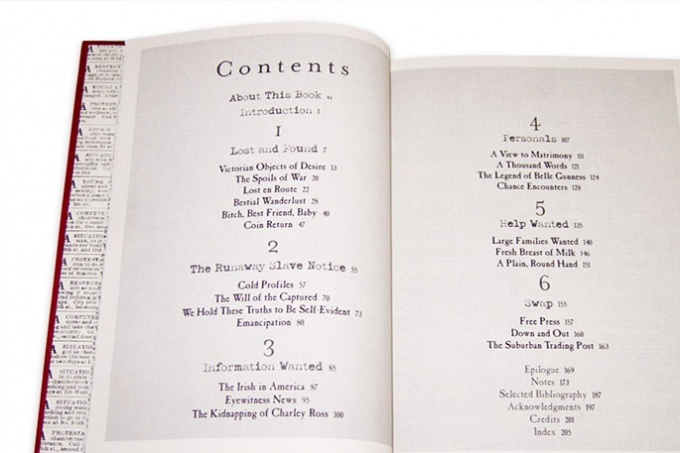 In books, pamphlets, brochures, student papers in the table of contents shows the section titles in the text. Thanks to the TOC reading it will be easier to navigate in the work. To ease the works on the design of the text, can be done in Word contents, the page numbers which will be updated automatically. 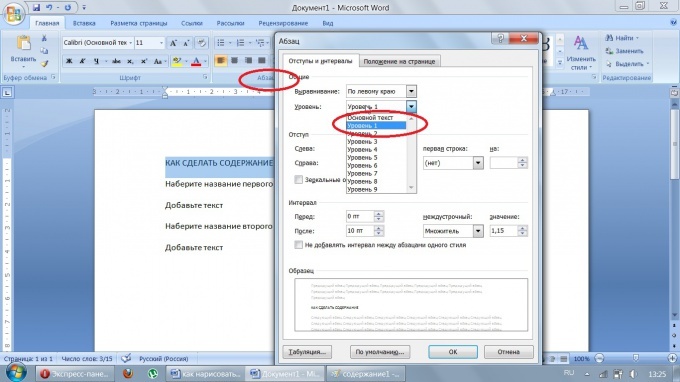 To do in Word contents, type the text and enter the name of each section. As you work you can update your table of contents automatically. Select the section titles which should be reflected in the content. In Word 2007, 2010 and later, select "Paragraph". In the dialog that appears, locate the line "level" and click on required value. If your text contains Chapter headings, subheadings and further sub-items, you need several levels in the TOC. Repeat the procedure for each header. When quite a lot of headers, each formatted quite uncomfortable. To facilitate the work will help the Ctrl key on the keyboard. Clutching it, you can select with the mouse the text you want in small portions, after which to call the tab, "Paragraph" for the relevant changes. Place the cursor in the place where you want to place the contents. To create an automatic table of contents, select the tab "References" at the top of the editor word section table of contents. Choose the appropriate option and click on it. So easy to make in Word the content in automatic mode. In the same tab, you can modify its parameters (location of page numbers, addition of hyperlinks to the sections, the number of levels, styles, etc.). To make beautiful content in the editor the word is possible through the same tab manually. Title of chapters and sections in this case, you will need to enter on their own. Ready-made content, you can automatically change the page numbers. You just need to click on it right button mouse and choose in the opened window "Update field". If you have changed the names of the sections of your content, you can make changes to them in the content. Otherwise, it is enough to update the numbering. Ready-made content can be formatted in accordance with your requirements. To change paragraph indents, spacing, alignment on the page, you need to select "Paragraph" in the main section of the editor. To change the size, color and style of the font, click the Font tab. 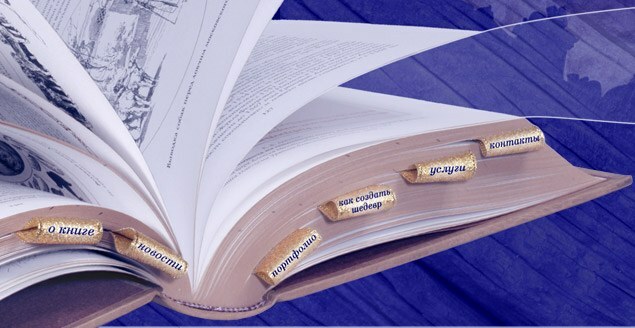 Thus, you can make in Word the content of any.